One may ask if we still have such community exist in Ghana or anywhere in the world in the 21st century. 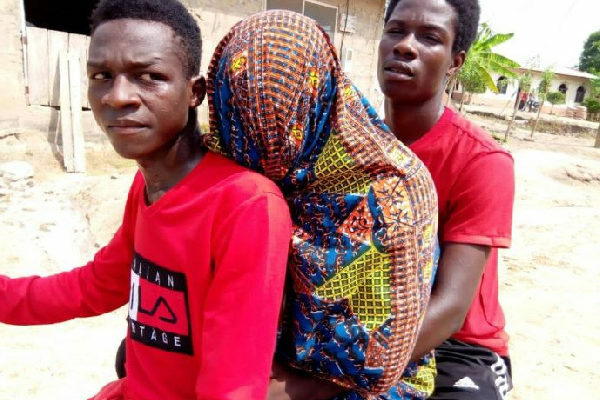 But as sad as it is, commercial motorbikes popularly known as Okada are being used as ambulance and hearse at Apau Wawase a farming community in the Ayensuano District of the Eastern region because the road to the community is not motororable. The road connecting the community to Asuboi and Suhum continue to deteriorate hence drivers have stopped plying the road. Okada is the only means of transport used to carry foodstuffs to market and transport passengers. Again, the commercial motorbikes are being used as ambulance to transport patients including pregnant women in labour from the health center in the community to referral hospitals. The Okada also serves as hearse to convey dead bodies to and from the morgue for burial in the community. “When someone dies, because the road is bad no car wants to come here, so we put the dead body on the motorbike in a sitting position, cover it with cloth so the bereaved family member will sit behind the dead body on the okada and hold it till we reach Asuboi where we get a car to send it to the morgue. Also when we are bringing dead body from the morgue, because of the road the Hearse can’t come so it leaves the dead body on the road for the family to use Okada to transport it to the community for burial”. Apau Wawase is known for the production of Cocoa, Cassava, maize, yam and Vegetables but the deteriorating condition of the road has made it excruciating for farmers to transport these farm produce to the market centers in Amanase, Suhum, and Accra. The problem has been a major discouragement to the youth to engage in farming hence most migrate to the urban centres in search for greener pastures. The Poor road network is not only having negative effect on agriculture but also health and Education as teachers and health workers posted to the community refuse to accept postings to the area. The few workers who have accepted posting trek about 10km from Asuboi. On January 16, 2019 residents embarked on a demonstration to draw government’s attention to their plight. According to Philip Konyor, leader of the Concerned Youth of Apau Wawase, Convener of the demonstration, politicians including their Member of Parliament, Ayeh Paye, should not attempt to campaign in the area in 2020 should the government fail to construct the road. He said, the only basic social amenity provided for the community since it existence is electricity. The Chief of the Community, Nana Okyere Amponsah said, the community will block politicians from campaigning in the community in 2020 if their road is not constructed.